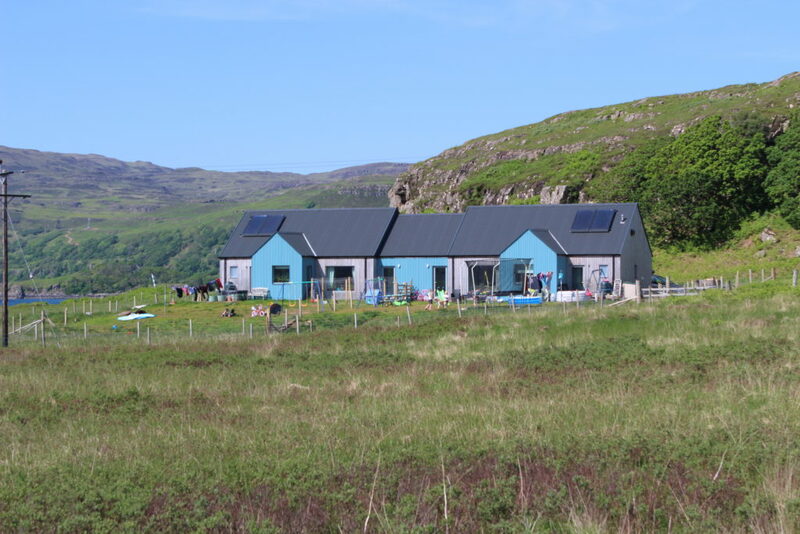 As Garbh Allt by Helsmdale in Sutherland becomes the latest community land buy-out, it’s important to develop ‘social memory’ from the growing list of projects across the country, and ‘community proof’ land reform. Rob Gibson assess the ways we can do this. When Scottish communities take over their land and start to plan their self-governing futures, just like nations, they are not insulated from the wider rules and policies that control such developments. These have a large bearing on the likely success of achieving local confidence and sustainability. Of the fifty-five members of Community Land Scotland (CLS) who have already set out on that road, each has started with a different set of assets and liabilities. I believe it would be very valuable to develop signposts for success for aspiring groups, notably the thirty-three pre-buyout members also listed in the CLS annual report. Last winter Alastair McIntosh wrote of the prospects for the Ulva buyout in Bella Caledonia on 2nd December 2017. He listed four main driving forces that help land reform to be a success. They are firstly, social housing with secure tenure and housing plots that can be created at low cost; secondly, creating business units to set free entrepreneurial initiative; thirdly, harnessing agricultural, ecological, sporting assets and renewable energy for the common good; and fourthly, community structures that foster psychological, creative, and spiritual benefits. 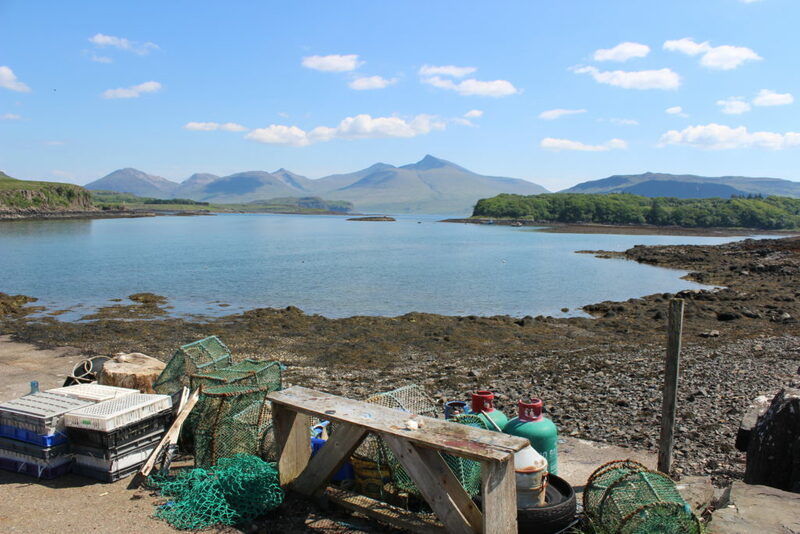 Ulva will be in community hands as of 22nd June this year. Undoubtedly, an increase to resident working families is a key driver to refurbish run-down houses on the island. We witnessed some of these on a visit late last month. They are vital for a new workforce to build agreed projects that support more families, not least to develop potential at the thriving, and now legally secure, Boat House restaurant where we ate delicious local oysters and langoustines among crowds of visitors attracted during the English schools half-term holidays. Here’s the rub, it’s not just getting the land, it’s negotiating the shark infested waters inhabited by planning regulations and utility rules. These are applied whoever the applicant is. That should surely favour local communities over private developments. So, let’s see how community empowerment works in practice in the current regulatory framework. Affordable rural and urban housing provision has increased markedly since the SNP government was first elected in 2007. But change is too slow to meet needs, population change and land price escalation. This was brought home regularly to me and my colleagues on the Rural Affairs, Climate Change and Environment committee (RACCE). During evidence taking for the Land Reform Bill in the summer and autumn of 2015 on many islands and across Scotland, witnesses were demanding that we build warm, affordable homes as the most urgent land reform outcome to sustain their communities. 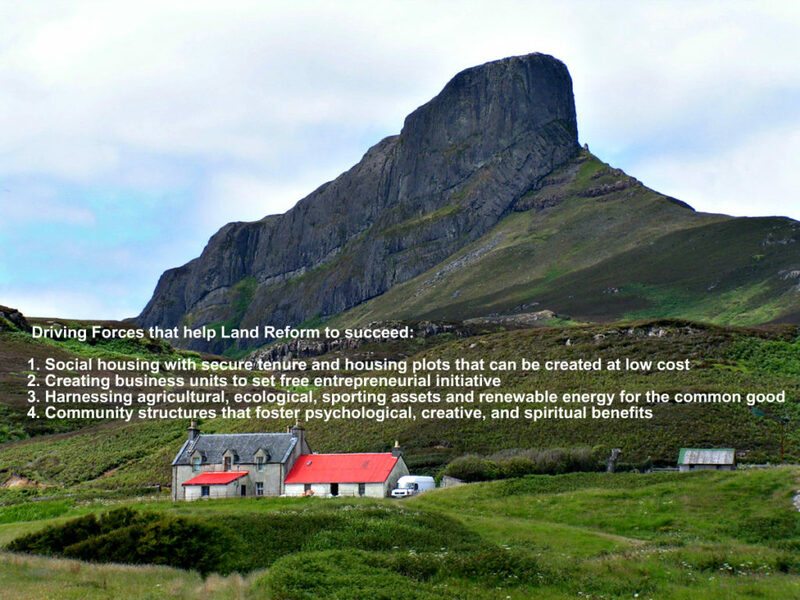 Yet housing was not included in the Land Reform Bill. Not to be put off, RACCE’s Stage I Report in December 2015 on the principles of the Land Reform (Scotland) Bill noted the numerous occasions when the lack of affordable housing was raised with us and the difficulties getting mortgages for private properties when they did become available. To fulfil the ambition of seeing thriving, sustainable rural communities across Scotland with more young people choosing to live and work in those communities, MSPs demanded increased availability of affordable homes. It couldn’t be clearer. Any hopes of repopulation need powers to make land available and at the same time affordable and eco-friendly houses require a sea change in production methods and planners’ thinking. Aligning the rhetoric of community empowerment with a range of government policies should transform prospects across the nation. In a widely shared polemic Alasdair Stephen called for massive state intervention to address the rural housing crisis in November 2016. He is a partner in the successful Skye and Glasgow-based Dulchas architects, who build eco-friendly homes, and he argued passionately that a thriving, dynamic economy needs the backing of big government. 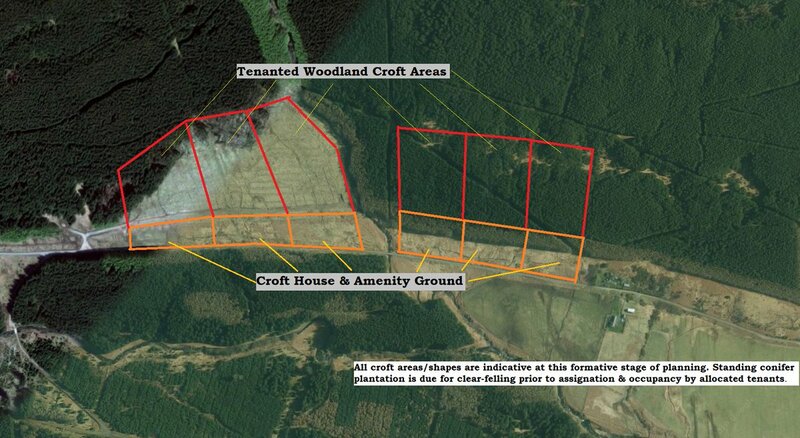 The key ingredient would be building “the biggest cross laminate timber factory in the world”. Then houses built of solid wood laminate, a state-of-the-art construction technique, would utilise the pine and spruce harvest from Scottish forests. Surveys indicate their availability as land agents, Savills, were advocating when sponsoring the CLS conference in Stirling this year. But, the proposed factory at EuroCentral has yet to emerge. Cross Laminate Timber (CLT) housing kits would suit many varied localities. Crucially Alasdair Stephen called for immediate changes in building regulations that are needed to allow these kits to be built cost-effectively, providing high quality, well-designed housing. Young people, the hope for future repopulation, if they qualify, should get CLT kits free, he declared! Then local tradesmen and contractors could complete the job. That’s a major infrastructure challenge – to align the portfolios of several ministers and truly join up policy that liberates the community sector from unnecessary restrictions. The second biggest of which is planning rules and policy. I discussed the idea of modular eco-friendly construction with SW Mull & Iona Development Company workers at Fionnphort a few weeks ago. Morven Gibson, SWMID manager would dearly love to use timber from their nearby Tiroran Community Forest for building new affordable homes in the area. During our discussion Rural Housing Scotland’s, Cameron Anson, pointed out constraints if modular housing were planned. Altering the number of modules affects the original financial package and requires planners to accept a possibly enlarged footprint of such homes. He also suggested that the needs-based model for consenting publicly-funded new build looked at past and present demand more than the aspiration to build new communities and reoccupy previously inhabited places. The current debates about landscape justice and repopulation of ‘clearances country’ assuredly requires a new approach to planning and funding. Therefore, it’s another case for big government action from Edinburgh to reset planning guidelines and housing needs assessment. Communities such as those on Mull need such actions at the earliest. Although retired as an MSP after three terms in Holyrood, freed from the pressing day-to-day duties of Holyrood and constituency, I have been able to delve into my longstanding interests in community empowerment, local renewable energy, affordable housing, and land reform. I write a monthly column for Energy North, the monthly supplement in the Highland papers owned by Scottish Provincial Press. The editor asked me to review a new book published last year. It’s A Critical Review of Scottish Renewable and Low Carbon Energy Policy edited by Geoffrey Wood and Keith Barker of Stirling and Glasgow Caledonian University respectively and includes a chapter entitled Community Renewables: Balancing optimism with reality. This was a stand out for me. That is a clincher for community proofing policies if ever there was one. I was also elected, along with other directors, to the board of Lochbroom Community Renewables in November 2016. We were embroiled in prolonged negotiations with Forest Enterprise Scotland (FES) to lease the land around the Allt a Mhuillin for our small hydro scheme which has now been built and runs, when it rains, near the Braemore Hall on the A835 east of Ullapool. The experience for our group of volunteers was far from straightforward. FES had already leased land for sixty renewables project in recent years. Yet the officers concerned offered us no checklist of dos and don’ts or a template to guide us. Many of their snagging, consenting and legal processes were protracted and frustrating, to say the least. Given the Scottish Government commitment to community empowerment, surely this needs urgent attention from such a key public agency? Of course, FES which is bound to take precautions against damage to their estate, is obliged by government policy to encourage diversity of land ownership and community resilience. Developers of community renewables have a thicket of perplexing rules to obey. Since 2010 the Tory influence on overall UK energy policy has seen drastic restrictions to renewables, particularly onshore wind because of a major outcry from the gentrified Home Counties. Meanwhile in Scotland with our abundant sources of wind, tides, hydro and wave power the effects of inconsistent energy policy reserved to Westminster has been severe. The idea of such a stocktake cries out to me – community empowerment needs an urgent audit of delivery as against rhetoric. Many of the constraints stemming from planning laws, the approach of government agencies, industrial development policy, for example CLT production, could unlock the wished-for flowering of even more community confidence. Back in 2012, Alex Salmond called for a million acres to be placed in community hands by 2020. A Scottish Government working group reported in November 2015 on ways to smooth the path. We now have the Scottish Land Commission to set up to make recommendations to Scottish Government for action. To win through we must get all parties to sign up to community proof policies. With both urban and rural groups poised to seek asset transfers and the challenge to acquire abandoned and neglected land it is of the greatest urgency to adopt at the heart of government a community proofing check list. Alastair McIntosh pointed to the key elements to guide community development in remote parts of Scotland. Now that Ulva is on the brink of celebrating a new lease of local self-government, it would be fitting for the First Minister Nicola Sturgeon, who approved the buyout, to compliment Ulva’s independence day with community proofing measures in the new programme for government in September, if not beforehand. That fits both urban and rural needs which are fundamentally very similar. More power to your elbow Rob.All good points well made. Sadly our Local Authorities are not always fully aligned behind the idea of maintaining and building sustainable rural communities. Current methodology for assessing housing demand needs to be turned on its head. Instead of attempting to estimate current demand, future demand has to be estimated on the basis of how many more young families it takes to make sure a community is and remains sustainable. Local Planning policies then have to fully reflect this need. It’s a brilliant, detailed article, one of the very best I’ve seen on land reform because of the depth with which it tackles housing questions as the main practical driver that transforms communities. I had not been adequately aware of how much planning issues are bound in, and while local authorities may be “not always fully aligned” I can sympathise with them given the pressures they’re under. What I was most left with from this article is that doing things one step at a time is hard when the issues are so tightly interlocked, requiring the vision, leadership and resourcing of holistic solutions. Well thought out piece. What can the rest of us do to move this forward? Lobbying visiting ministers is the best start. Quizzing the local council planning chairs would be an eye opener. Meanwhile here in Applecross we still have no access to land for affordable housing after many years of effort (more than ten in my own case). The school role dwindles, young people leave, businesses struggle to attract enough employees. We’re still trying; the latest plan is to work with PAS (formerly Planning Aid Scotland) to bring all to the table at the same time, landowner, community, affordable housing specialists HSCHT and council planners. Lack of access to land is holding back so many much needed developments in a community with huge potential. Although the article highlights some of the issues in economic and social development, exemplified by housing and renewables, it rightly highlights that a radical cross-cutting series of interventions are required. The Scottish Government could benefit from a very, very detailed programme for integrated community owned economic and social development. Currently, although seen as radical in the context of an advanced European economy, the land reform and community ownership and empowerment agenda is timid. Local communities are invited to pay the market price to a Local Authority for land which the community (via the LA) already owns. Then, the community will provide services which the Local Authority should have actually been providing to the community anyway. Local community members are then be invited to pay a price for use of those services. In the process of setting economically sustainable prices for use of these services, poorer members of these communities are often further excluded. This is currently repeated across Scotland and hailed as empowerment. I don’t blame Councils for this – they are under tremendous financial pressure, with cuts in Scottish Government funding. I don’t blame the Scottish Government, they are dealing with cuts in both UK funding and potentially EU funding coming down the line. I don’t blame local community bodies for setting economically sustainable pricing and developing community led services, they don’t have a choice because as the author pointed out right at the beginning of his article, community ownership is not insulated from the wider rules/policies in society. However, a larger, significantly more radical integrated approach to community ownership across Scotland is required – with £100s of millions in budgets and policy platforms to support it. Great article Mr Gibson, and you and Prof Alastair McIntosh have defined some worthy targets, but there is still a lot of work to be done on communication. There is still a need for a book that explains some of these objectives in a tabloid form. Many still see land reform as being yorkshire hippies and the like milking the common purse fro their own ends.